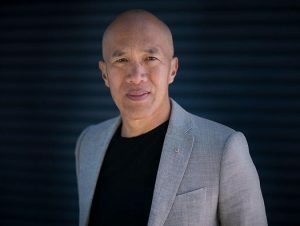 Professor Teo is best known in Australia as a fearless neurosurgeon, who pioneered the use of endoscopic techniques in brain surgery, minimizing recovery time for patients. But many Australians would be unaware of his personal crusade to save the world’s endangered orangutans of Borneo and Sumatra, and significantly, the rainforests in which they live. Charlie, his wife Genevieve and their 4 daughters went on an eco-tour to Borneo to see the work of the world’s foremost authority on orangutans and founder of Orangutan Foundation International, Dr Birute Mary Galdikas. They traveled by boat, deep into the heart of Tanjung Puting National Park in Borneo’s Central Kalimantan region, where Dr Galdikas established the Camp Leakey research station in 1971. It remains an active research hub for these great apes, with Dr Galdikas continuing to head a dedicated team. During their week long visit, Professor Teo and his family were instantly taken with Dr Galdikas, the quietly spoken orangutan lover, and inspired by her latest project to secure the orangutan’s habitat, by buying vast tracts of land, to prevent its wholesale destruction. “Orangutans, share approximately 97% of our human DNA, and it’s blindingly obvious when you see the mothers interacting with their families with such “human like” qualities,” said Professor Teo. Whatever the reason, these adorable great apes, are on the brink of extinction. It’s crystal clear …. Buying rainforest is not only the BEST way of securing orangutan habitat, it may well be the ONLY way. OFI is run 100% on donations and every dollar you give makes a difference. Orangutan Foundation International Australia acknowledges and thanks you for your very kind gift. All donations received are fully Tax Deductible for Australian residents. For all Bank Transfer donations please email info@ofiaustralia.com with your Name, Business Name, Address, Phone, Email Address and the amount of the donation - so we can send you a Tax Deductible Receipt. 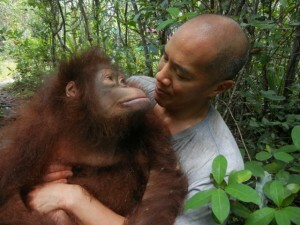 Please make cheques payable to Orangutan Foundation International Australia. Credit card donations can also be made over the phone. Please call 07 5527 5226. The Board of Orangutan Foundation International Australia would like to express their deep and sincere thanks to Josh Boorman & the team at Atomix Web Design in Adelaide as well as Micron 21 Data Centre in Melbourne.